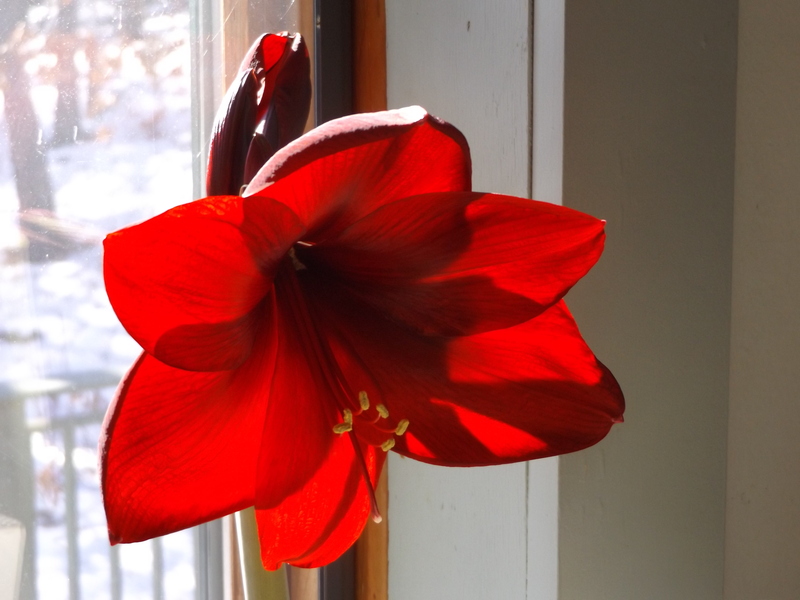 My daughter gave me this amaryllis a year ago at Christmas. My sister enjoyed the blooms since I was sick and couldn’t get to her house where our family Christmas is held. So once I received the bulb I grew it in the vegetable garden, pulled it out in the middle of October and put it in a cool spot to rest. I pulled it out in January and here is the bloom in March. Thank you, Karen! This is the first of four blooms on the stem, so I have some more flowers to enjoy. The red flowers seem to be sparkled with glitter. It is gorgeous! Once the blooms have faded, I’ll cut them off at the base of the bloom. The stem holds chlorophyll so will give the bulb some extra nutrition. After a very long, bleak winter, this fiery bloom lightens my spirit. I’m going to replant it this spring once the frost date is past. After ten days on the porch for the leaves to acclimate to stronger light, I will take it out of the pot and grow it directly in the soil. Because it will already have a strong leaf system in place this year, the bulb should grow even larger. I plan to see it is better fertilized and watered this summer, too. If I want to try and have it bloom at Christmas, I’ll have to repot it and put it into its rest period by mid August. It needs to be kept for about eight to ten weeks in a dry and cool state of relative darkness. September really works better to start the rest period, and October after the first frost seems to be best. I’ll have to wait and see how well it has grown by August and decide then. I don’t mind seeing the bloom in March. The U.S. National Arboretum says this process can be repeated indefinitely. I’ve had amaryllis before, but after a few years they didn’t grow well; however, this could have been me not giving them enough attention.